Peri are a fragile desert dwelling folk known for their unearthly guise, elusive nature, beautiful songs and potent charms. Legend holds that they're descent from fallen angels, exiled from Heaven because of his love for a djinn princess. Other sources claim that the Peri are actually descendants of a plane-touched queen called Sorush (probably an aasimar or even a half-celestial) who was seduced and corrupted by Ahriman. However, Sorush saw the evil in her ways and swore to atone before Heaven, never resting until the Lord of All Div and his spawn were vanquished. The Peri are also known as the Hidden Ones, the Elusive Folk, Angelborn, Desert Fey and Green Feathered Ones. Peri are lighthearted in a serene and shy way that led many to think of them either as fey spirits (because of their elusiveness) or monastic aasimars (because of their simple dwellings). Actually Peri are passionate and artistic, although they prefer to express their crafts and lore through pleasant and peaceful songs and exquisite weaving. Peri silk is considered magical by most desert human tribes. Peri nature is calm and balanced, though their wrath is like the desert – quickly, silent and unmerciful. Common folklore holds that only three things can ignite a Peri’s fiery anger: a broken vow, a man who spoils beauty and the presence of a div. Peri are easily mistaken for aasimars or even celestials. They’re beautiful and graceful humanoids of pearly-white and almost luminous skin, feverish hot to the touch; their hair is usually white, bright red or shiningly gold, flowing on its own, even when indoors. Peri have an ephemeral quality to their bearing and are clearly creatures of otherworldly blood. The most distinct trait of a Peri is its fey fragrance – Peri smells like full grown gardens in a summer night (or like the first summer nights in Heave must have smelled). It’s said that Ahriman (and divs in general) are intoxicated by a Peri’s fragrance. Many div hold Peri prisoners inside special magical iron cages that preserve them for eternity. Peri are not called Hidden Ones or the Elusive Folk for nothing. Most desert tribes regard them as legendary creatures or as servants of the Gods, treating them either with religious awe or superstitious fear. Usually, the contact between Peri and the outside world is done through tribal princes, clerics, oracles, druids and paladins. Many Peri also disguise themselves “as mortals” to walk the world, easily being mistaken for paladins or holy men. In great cities – like Merab, Azir, Katapesh and Katheer – Peri are relatively well-known (at least as far as plane-touched races are known). Aasimars and elves are usually happy to deal with them, while humans and halflings are always fascinated by the Hidden Ones. Gnomes obnoxiously believe that Peri are a lost fey race from the First World, while dwarves and half-orcs can’t tolerate the “perfumed desert elves”. Genies – especially Janns and Djinns – treat Peri (if weak) as potential and valuable servants or (if strong) respectful guests. Peri tend toward Neutral Good, always displaying the more gentle aspects of both Neutrality and Good. Lawful Peri are called Angelborn by their brethren and treated as fanatics, while Evil Peri are known to suffer the ravaging effects of old age prematurely. Many believe that an Evil Peri that dies is reborn as a div. Peri are a very small and vulnerable race and make great efforts to remain hidden from the world. They don’t have nations or territories of their own, but possess a rich and millenary culture. They live in oasis secluded by illusions, enchantment and pacts with elementals and local outsiders. Ironically, most Peri oasis in the Inner Sea of Golarion are located in the godless nation of Rahaudom, although the traditional families live in the deserts of Thuvia. The royal bloodlines of the Peri (like the sons and daughters of mythical Sorush) still live deep in the Windswept Waste, within the Empire of Kelesh, in Casmaron. The Peri are respectful of the power of the Gods, but devote themselves to appease the celestials powers of the Outer Sphere – particularly the ruling archons: Ragathiel, Sandalphon, Jegudiel, Andoletta, Uriel, Melek Taus (specially this one) and Salaphiel. Peri have their own language, Avestan, which seems to mix Kelish with Celestial. They also speak Common (Taldan), Elven, Gnoll, Sylvan, Sphinx, Draconic, Celestial, Abyssal and the elemental languages. Typical Peri names can be found here . Most Peri adventurers are either curious wanderers or courageous (and mad) div slayers. A few are exiled from their families for crimes that range from kin slaying to falling in love with “mortals”. · +2 Charisma, -2 Constitution. Peri are unearthly and ephemeral. · Artist Soul (Ex): Peri gains a +2 racial bonus on Performance checks. Once per day they can substitute one Handle Animal, Diplomacy or Bluff check for a Performance check. Performance is always a class skill for Peri. · Inspiring Muse (Ex): Once per day, a Peri can substitute one Craft, Profession, Knowledge, Spellcraft or Use Magic Device check done by an ally within 30 ft. with a Performance check. · Desert Bound (Su): Peri gains a +2 racial bonus on Survival checks while on desert terrains. On deserts Peri are constantly under the effects of endure elements and doesn’t require food or water. · Climb the Winds (SA): Under an open sky and unrestrained by chain or rope (and not grappled), a Peri can use at will use feather fall, fog cloud and levitate (on herself only) as spell-like abilities (using her character level as caster level). While using any of these spell-like abilities a Peri either glows warmly with ghostly flames or manifest spectral green feathered wings. · Heavenly Fragrance (Su): Peri exudes a powerful and flowery scent at all times. Creatures within 30 ft. of a Peri must succeed at a Will save (DC 10 + ½ character level + Char mod) or become spellbound by the fragrance. The Peri gains a +4 racial bonus on Diplomacy and Bluff against these targets. As long as the Peri refrains from violent actions, she’s treated as if under the effects of sanctuary against spellbound targets. These effects last for as long as the target remains close to the Peri and approximately 10 minutes after leaving the area. Creatures that succeed at the Will save are immune for the next 24 hours. Heavenly Fragrances doesn’t affect constructs, outsiders, fey, undeads or any creature immune to charm. It also makes things really difficult for sneaking Peri, as the fragrance betrays their presence. Creatures with Scent gain a +8 bonus to track Peri. · Green Feathered Ones (Su): a 9th level Peri can spend a feat to gain this additional race feature. While under an open sky and unrestrained by chain or rope (and not grappled), a Peri can – as full round action – manifest green feathered wings. This is a supernatural ability that works like overland flight (caster level 9), with the restriction that a Peri can only use it while bathed by sunlight. One of the things of RPGs (and literature in general) is that there can be multiple interpretations for the same legend, myth or tale. The Peri are a perfect example. I first heard of them in an old RPG.Net post and started instantly to search for references for these exotic Persian fey/celestial creatures. I just loved their flavor and the tales of how Djinns and Ghuls trapped Peri because of their beauty and perfume. I wrote the entire race above without consulting reading the Peri “monster” stats from the Pathfinder Bestiary 3. Rereading now that entry stats I’m glad to find out that the official Pathfinder Peri are also fierce enemies of the div. 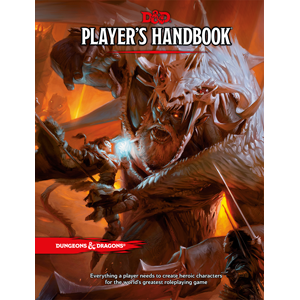 It shows how Paizo treat is research and material. Although I really like the CR 14 Peri, I still believe that there’s a lot of potential for a player character race in this legend. Of course, nothing can stop you from using both versions of the Peri. Personally, I would use the “monster” Peri to represent the royal bloodline of the race (or just the first Peri). 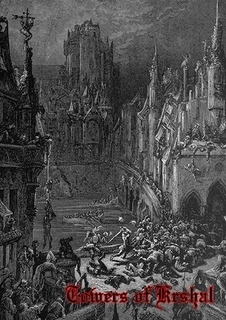 Towers of Krshal – the Disturbing Supplement about the Sinister City is the OSR-product of the moment. This 32 pages PDF is a series of tables (and a few maps) describing the bizarre city of Krshal, which can cover an entire world, could have been built over a “grave temple” of titanic size and is probably run by sapient Difference Engines. As you can see all this “cans/coulds/problablys” give a good idea about how this product works. The author uses various random tables to summon a flavor and a series of themes that describe to the Referee the bizarre/unsettling/weird vistas of Krshal. It’s like reading a “lite version” of Vornheim and its great! There tables are: Rumors about the City, Name of the Citizens, 20 Towers, 12 Sinister Sorcerers (excellent! ), 8 Thinking Difference Engines (I’m still not sure on how to use these), 50 Drunkards (perfect! ), Ossuary random findings, Scrap Yard random findings, Trash Pit random findings, 20 Ghoul Mothers, 20 Cthonic Gods, Six Blind Demons (another of my favorite), 20 Magic Lanterns, Six Lethal Molds, 20 Magic Keys, Weird and Unusual Items, Swarms! and Ten Gardens. Towers of Krshal also has a vertical stylized maps of the City’s Sewers, the Palatial Complex of Mar Gat’nep and the Reverse Pyramid; besides a dungeon (the Demon’s Entrails – the Worm Maze). Towers of Krshal is a very direct product. There’re no illustrations or layout, just clean text with simple formatting. The map’s graphics aren’t eye-opening, but are useful and inspiring. Actually, this is the kind of product that gives you ideas – lots of ideas. Maybe my Vornheim analogy isn’t 100% precise – while you can use Towers of Krshal on the spot for Old School games, it works best as a set of ideas to be developed. You can find the PDF of Towers of Krshal, for $3.50, here. This is my finding of the week. I don’t have the slightly idea if this thing is new or old (or just a potential vaporware – I hope not!). Cavaliers of Mars is a beautiful 17 pages colored PDF, with a really evocative B&W art. Return now to dying Mars in its last age of glory. A planet of flashing swords and choking sands, of winking courtesans and lantern-lit canal cities. Mars, where fortune and death are two sides of the same obsidian chit, where lost cities and dry oceans stretch between the last bastions of civilization. Where the First Martians, the monument-builders, are but a haunted memory. Where the Red Martians become decadent and reckless in their last days. 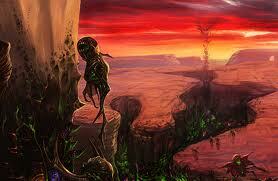 Where the Green Martians rule the wastes, remembering a history whose weight would crush a lesser people. Find yourself dashing across the towered crypts of Vance, digging desperately for treasure in the lost tombs of Chiaro, spitting defiance at the Roundhead priests of wild Ziggur. Lock steel with the Princess Invincible, even as your hand reaches towards your flintlaser for insurance. As you can see there’re a lot of clear references to Planetary Romance authors and elements and it’s easy to see form where the authors are pulling their sources. OK, the setting is great, the product is evocative and engaging… what about the system? Well, this is where Cavaliers of Mars really surprised me: it’s based on Wushu (although I do hope the authors rethink their original idea of using other systems –like Barbarians of Lemuria, FATE and Honor + Intrige). I must have read Wushu a dozen times already but the system never managed to grasp my attention. 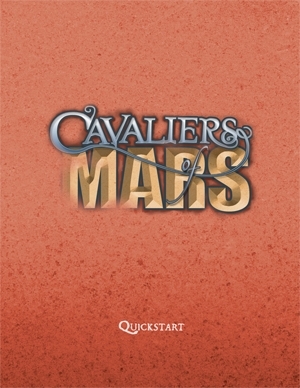 I understand why some people like it, but it’s one of those (rare) RPG systems that I’m sure I’ll never used… until I read Cavaliers of Mars. The authors’ version of Wushu really managed to draw my attention to a system that I never really cared. If there’s stronger point for buying a RPG product than that, please let me know. Oh, and did I tell you that this Quickstart is free? I received a few months ago a review copy of The New Death and others. The New Death and others is a 94 pages collection of 19 poems and 44 short tales (with links, thank you!). The first thing that any fantasy/horror enthusiast will be interested are the poems based on the works of R. E. Howard (The Mirrors of Tuzun Thune), H. P. Lovecraft (Under the Pyramids), C. A. Smith works (The Garden of Adompha) and Lord Dunsany (Charon). Given those references, it’s certainly not a coincidence that The New Death and others is inspired, thematically if not stylistic, in the fantasy cycle of those authors – particularly Lovecraft and Smith. It’s nothing as heavy or arabesque as those authors’ prose, which actually is a good point for many, especially first readers. Hutchings’s fantasy is a mix of the whimsical, the bizarre and the mundane. The first tale – The God of the Poor – is simple and direct, almost fable-like. The second one – How the Isle of the Cats Got Its Name – is pure fantasy and very flavorful, and I wish there’re more material along these lines. The Scholar and the Moon is my favorite – imagine if Miéville attempted to narrate weird stuff in the surreal and succinct way of C. A. Smith. It has all the right elements (for me at least): a protagonist with an esoteric (and egoistical) quest, strange denizens (like the gargoyle with silken-like wings) with yet stranger customs, a bizarre realm (the upper levels and hidden temples of a human city) and a doomed (besides sarcastic) conclusion. The Scholar and the Moon takes place in Hutchings’s Telelee fantasy (and I believe campaign) setting and is just great. Many of The New Death and others’ tales (and even a few poems) are modern-time parables. Examples include The Doom That Was Laid Upon Fame and Weary Love. They remind me of Neil Gaiman’s work – again, thematically. Some short stories are total oddballs (in an already eccentric collection) but ones that provide good surprises and variations – like the flavorful The New God. I quite like the author’s humor, although at times the puns and references are just silly – The Adventure of the Murder Philanthropist and When Love Calls. However, even in those cases the author does manage to pull interesting twists – like in The Face in the Hill. 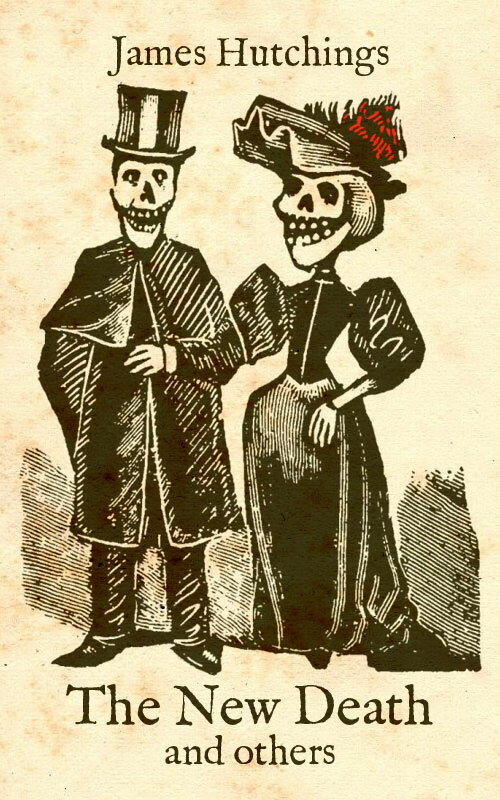 You can find the Kindle Edition of The New Death and others for $0.99 here. 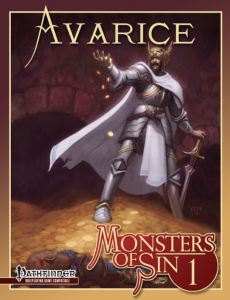 Monsters of Sin 1 – Avarice starts a new line of PDFs from Open Design. Each Monsters of Sin is a 10-pages colored PDF, with a beautiful cover and layout, bringing to Pathfinder 3 new monsters, and 1 high CR outsider – all thematically-aligned to one of the famous deadly sins. The first Monsters of Sin is all about avarice. The PDF doesn’t waste words and, after a brief paragraph of text, we get the new template – Avaricious Creature. It allows the creature to heal wounds by ingesting treasure. It’s a very bizarre trait to be applied generically – although it does make a lot of sense for dragons and certain outsiders (like devils). The new monsters are the Hoard Golem (CR 12), the Map Mimic (CR 1) and the Midasite (CR 4). Hoard Golems have a terrific flavor text (“born from the paranoia of dragons” is a great line) and literally creatures made of treasure. It’s a great concept and the probably the monster whose body will be the “pillage dream” of any adventuring party. The Map Mimic is a variant (and delightful) take on the (almost) homonymous creature; while the Midasite is a bizarre insect-like fey that can turn people and objects into gold (a power that, I believe, deserved more serious limitations). The Embodiment of Avarice is a CR 20 avatar-like monstrosity which can be used as the backdrop for an entire adventure – particularly if the GM extrapolates the concepts behind the creature’s Avaricious Aura and Stomach Vault (personally I’d expand it to a full dungeon). Monsters of Sin 1 – Avarice costs 2.99 bucks. One of the reasons why I love Golarion (besides its pulp roots) is because it’s such a charming kitchen-sink campaign setting. You have the usual – lost worlds, realms of barbarians, a land of good crusaders facing a Big Bad Evil, a fantasy Africa, a fantasy Egypt, a wild frontier, a land of unruly and chaotic barons/dukes, a demon-infested wasteland, an almost steampunk realm, a super-science! realm, a land of mists and classic terror… there’s a little of everything here. Ironically, this trait is also one of the reasons why many hate Golarion. I admit that I’m not (too) worried with verisimilitude for basic fantasy settings (and if I want it I can always go back to settings like Harn, Valus or Kalamar). Anyway, I’m (as usual) digressing. One of the cool things about kitchen-sink settings like Golarion is that you can approach it with different lends, thereby creating campaigns that highlight one style of fantasy over another. In fact, I’ve been doing that – here’s Sword & Sorcery Golarion and Science Fantasy Golarion. Now it’s time of Mythic Golarion. The idea for this setting variant came from an article by Mike Mearls where he suggested that you could make a campaign more exciting by making its cosmology more “personal”. The given example was to take the Abyss and change it from a plane to a physical location (like the Shadowlands from Legend of the Five Rings). This reminded me a lot of cosmologies like Tolkien’s Middle-Earth or even classical Greek (Mount Olympus, the Tartarus etc) and Nordic (Yggdrasil, the Bifrost, Asgard etc). In many ways it’s a lot cooler to know that things link Mount Olympus, the Abyss or the Nine Hells are “real places” in the player characters’ own campaign world. 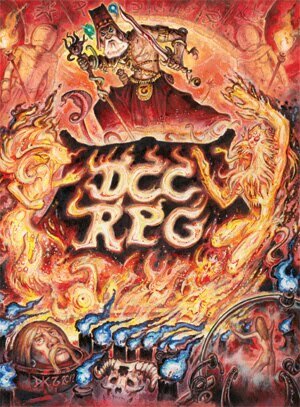 Imagine that, if instead of using plane shift to visit the Outer Planes, the PCs delved in the depths until they reached the Nine Hells and freed their comrade soul from a devils’ hold. Unfortunately, I don’t think that this mythical flavor mix wells with many classical pulp aspects – like the existence of other planets, solar systems, alien races and a more “realistic” physical universe. Settings with a mythic flavor work best as their own closed microcosms. There may exist things “outside”, in the Void (like Ungoliant in Middle-Earth), but these are always exceptions. Another trait of mythic settings is that the various races and powers origins are always fixed (even if not clearly). Thus, the first step in making our Mythic Golarion is throwing away conventional/scientific aspects of the cosmos. Golarion can still be a globe, instead of a flat disk floating in the Void. Actually, given some aspects of its legends, it makes more sense. After that we need to fix its origins and establish roughly how the main powers/deities were involved. I’ll leave aside, for this post, any references to pantheons outside the Inner Sea Campaign Setting. You can either make the Greater Gods of the that book universal, or instead rule that they’re just one of the original divine families that witness the Beginning (other pantheons could be the oriental one, described in Dragon Empires Gazetteer). The most important event of Golarion’s myths is undoubtedly Rovagug’s imprisonment by the gods. With this event we can establish all kind of cool mythological themes and explanations for why Golarion is the way it’s now. First of all, let’s establish a clear division: Gods and Demons. Creation and Destruction. I also quite like the idea that Demons are the original inhabitants of Existence. At the Beginning there was only the Endless Night of the Abyss. In this realm of infinity and darkness came the Gods (or the Creator, or the Proteans… actually, maybe the Proteans were here before even the Demons). The Gods “buried” (metaphysically speaking) the First Creation of the Demons (the Abyss) and built a Second Creation over it – a world of exuberant immortality, vitality and life. Paradise. However, let’s say that they exaggerated and spent the next eons fighting their unruly and passionate subjects. This is the so called “First World” of the Fey. In the end, incapable of ever ruling and controlling such powerful and almost sentient realm, the Gods decided to “seal it beyond time and shadow”. This event marked the beginning of the Second World – the known Mortal realm of Golarion. Those primordial wars against the Fey made the Gods forget the Abyss. Eventually It stroked back. The Abyss sent the greatest (so far) Demon known to God, Mortal or Fey – Rovagug, the Rough Beast. The resulting battle changed completely the face of Golarion and probably extinguished entire races of Mortals (it also reopened various gates to the sealed First World). The Serpent Folk and the Aboleths are one of few pre-Cataclysmic races that still survive, although the later are reputed to be actually the spawn of something from Void. In the end, after many casualties, the Gods sealed Rovagug deep in the most powerful and feared prison ever built – the Nine Hells. The Nine Hells are made of nine layers, contained inside each other, built deep below the Darklands. Asmodeus holds the Key to the Bottomless Pit and is the Divine Jailer of the Gods – a role that he never lets anyone forgets. The devils are the Nine Hells’ wardens, legitimately authorized to punish the souls of those that worked against the Gods – including the faithless, the demon worshippers, the heretics, the excommunicated and the servants of the fey lords (among others). The Nine Hells is also a prison for other powerful entities, particularly outsiders and immortal beings. While Asmodeus heartily denies it, the Nine Hells aren’t infallible – some fragment and blood of Rovagug eventually leaked out and tainted the Darklands, giving birth to abominations like the neothelids and tainted races that went to the depths, like the drow, morlocks and duergar. The Spawn of Rovagug (like the Tarrasque) are another symbol of shame to the devils (who strongly hunt and help those that try to defeat them). This leads to another important distinction: cosmologically speaking beings like Lamashtu and Rovagug are Demons, not Gods. Calistria and Desna are mighty Archfeys – probably one of the Eldest. The Gods, deeply wounded and permanently diminished by their battle against Rovagug, retreated to the Crown of the World and built the most wondrous, impregnable and might fortress ever seen – Gilded-Walled Axis, City of the Immortals. From there they send their dreams and commands to their clerics and wait for the fated Doomsday, when the Rough Beast shall rise again. The truth is that the Gods deeply fear leaving Axis, for in Golarion they’re still vulnerable – another reason is the Divine Covenant: it’s forbidden for a deity to strike against another inside the gilded walls of the City of the Immortals. Only a few deities ever leave Axis, and then always for good and very specific reasons. Seranrae and the other Six Solars (there’re only seven of them) live on the top of the holy Mount Elysium, the highest mountain of Golarion – somewhere in the continent of Casmaron. Legends hold that the Dawnflower holds vigil over the tomb of a forgotten deity. 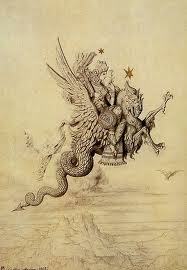 Some whisper that this deity is the brother of Asmodeus, slain by the Rough Beast. Pharasma lives in the Moon, which I is where her Boneyard is located and where the souls of the dead Mortals go to be judged before journeying to their respective places of rest, in the cold, mist and silent vaults of the Moon (the exception are those souls sent to the Nine Hells). There’re myths that preach the existence of a dark and unseen moon called Abaddon, dwelling of the Wrath of the Gods – the Four Horsemen and their legions. While devil are forbidden from leaving the Nine Hells (unless summoned by fools or the priests of Asmodeus), the Four Horsemen (and their servants) have leave to scourge peoples and nations that offend or displease the Gods. Pharasma and Seranrae are, however, opposed to Abaddon and suspects that the Horsemen take advantage of the Gods’ fear of leaving Axis and secretly raid Golarion for mortal souls, building armies inside the hollow moon of Abaddon (I’m tempted to make Urgathoa the Horsemen of Famine). In Mythic Golarion the Starstone is the ultimate mystery. The Gods don’t know that the Starstone is, only that it is impervious to their power or influence. They know that It came from the Void, but nothing more. They watched, in fascination and horror, the ascension of Aroden, the Living God, and never accepted him inside Axis. His mysterious death, on the other hand, cemented the Gods’ fear of the Doomsdays and their own End. After Aroden’s death, no God ever left Axis again, while Seranrae secluded herself at the hidden pinnacle of Mount Elysium. The so called Age of Lost Omens marked the return of the Abyss, the Eternal Foe, which devoured the nation of Sarkoris and created the Worldwound. The Gods, through their priests, give the knowledge of the Wardstones to the Mortals, to contain the abyssal taint. As you can guess, the Elves are natural from the First World, from the ancestral and time-locked realm of Sovyrian. The Aboleths are another mystery, being the spawn of the Void. The only God who tried to peruse the spaces outside Existence returned as Zon-Kuthon, the Stranger, the Midnight Lord, who now leaves segregated from the remaining deities. The oceans of Mythic Golarion replace the Elemental Plane of Water. This is an idea stolen from Tanith Lee’s Tales from the Flat Earth (I do recommend it very much!). The oceans’ surface is “normal”, but if anyone dives deep enough he’s considered to be in another realm, with its own rules and magic. The Airs Above are likewise divided in a myriad of realms, each stranger than the former. The Lower Airs are home to floating islands of the Azatas, the Middle Airs are the Elemental Plane of Air, abode of the Djinn. The elusive and distant Upper Airs are the domains of the Angels and Archons, who watch – in the starts – for any menaces from the Void. Legends hold that Mount Elysium’s top reaches the Upper Airs. Deep below the Darklands, and conterminous to the Nine Hells, are Golarion’s Divine Forges, ex-abode of Torag, the Smith of the Gods, and now the home of the Efreet and the Salamanders (this is the new Elemental Plane of Fire). At Golarion’s borders, beyond the farthest lands and oceans, lies the World’s Barrier. Imagine Golarion as if it was a stone bowl. It’s surrounded above by the Lower, Middle and Upper Airs; below and at the borders by the World’s Barrier. Beyond the World’s Barrier lies the leftover of Creation, flotsams of unfulfilled potentials and probabilities – the Maelstrom, home of the Proteans. Finally, one last topic to really tie up this Mythic Golarion – the land of Numeria. I don’t think that a technological realm fits with this theme. I’m tempted to leave Numeria “open” for now. But, if you still want to add a strange flavor it, just changed the type of “technology”. Maybe a Silver City of Inevitables, coming from the Void, crashed over Numeria. This way you still get the strange metals, the “automatons” and maybe even mad alchemists and half-golems – all without radiation, cybernetics and Golden Age robots (although nothing can really stop you from using them). I know there’re a lot of missing topics to address, but I’m just making broad assumptions here, not writing a new Golarion campaign setting (and this post is already too long that I fear anyone will read to the end).